These are my favorite flatwounds, period. I realize that many players will prefer heavier gauges overall, but for me, just swapping a .013 for the top string = all the jazz I'll ever want or need on any archtop, semi-hollow, or solidbody. Guitar. I'm hooked! 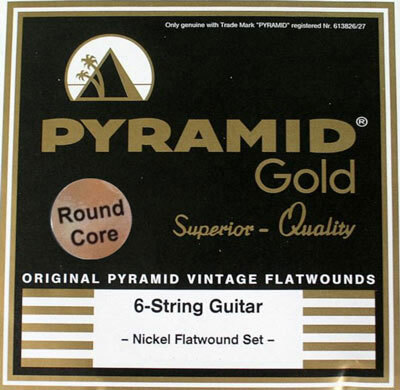 These are my favorite flatwounds for tone and intonation. Strident and/or warm depending on the pickups. Strings Ny Mail always gives quick, thorough, and courteous service. Deep selection on all strings for all things. Q: Are these strings in-stock and ready to ship? We currently have about a dozen of the 411 100 sets ( Pyramid Gold Chrome Nickel Flat Wound Round Core Electric Medium 11-48) on hand and ready to ship. Hope this helps. I reviewed our listing and can't find any errors off hand. What do you see? Thanks for your inquiry.